Sloane Whitaker hates everything about moving to Texas. She hates leaving behind her friends and half her family in New York, starting over senior year at Austin's NextGen Academy, and having to say she lives in Texas. Most of all, she hates that it's all her fault. If she wants to earn her way back to the Big Apple, she has to prove she can still be the perfect daughter. Which means no vandalism art, no trouble at school, and absolutely no Tru Dorsey, her serial screw-up neighbor, who loves nothing more than pushing her buttons. But from the moment he vaults onto the roof outside her bedroom, there is something about him that makes her want to break every rule. 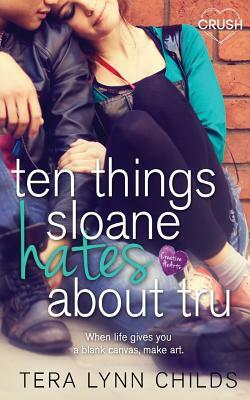 Suddenly it's not the ten things she hates about Tru that are at the top of her list. It's the ten reasons she doesn't want to be without him.